Recently i upgraded my windows PC from 7 to 8 and on the same pc i updated my Ubuntu 12.04 to 12.10. When i opened up my Windows and looked for those files they weren't there. I was shocked and thought i might have deleted them my mistake somehow. I quickly switch OS back to Ubuntu and found those files to be present in that drive. I cross checked one more time and found out that this certainly was the case, weird right..?? I later found out that the files were there on the hard drive it was just that windows wasn't showing it. we will cover that in some time, but first lets first solve the issue that we have in hand. 2. Right click on the drive where you are facing this issue and go to properties.. 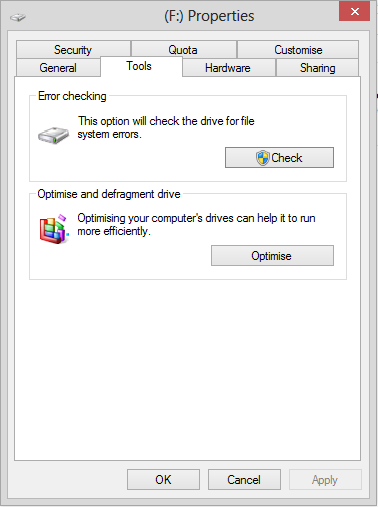 This will scan the drives and if it finds some error (In our case the files that are there in the drive but not showing in the Explorer), It will give you an option to fix it. This will cause your drive table to be update and you will be able to access your files and folders on Windows too. Now the reason i think this happens is that Ubuntu is unable to update some of the allocation table files that windows uses to manage drives. I am not confident about this, But i think this most probably is the case here.